Free from cakes and bakes : A handy, scrumptious guide to chain coffee shops. These days it feels like negotiating a minefield, but thanks to trial and error over the years, I've put together this handy updated guide to some of the country's most known chain coffee shops to help you along the way. 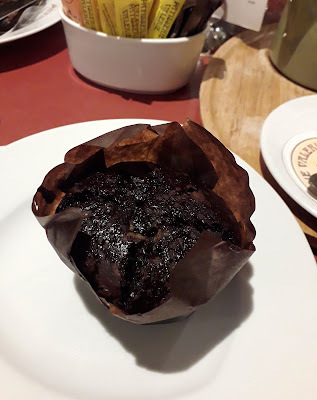 I'd already took a look at free from coffee shop bakes a couple of years back, but as can be expected with most chain coffee shops, menus have changed, and dairy free options have vastly increased since then. Whilst we are lucky to have more options than previously before, it's still feels like a long slog trying to find out what exactly is safe to eat when you suffer from a food allergy, intolerance, or autoimmune disease. There's still plenty of room for improvement with the majority of chain coffee shops, but needless to say, at least some of them are trying to make those changes. So what tasty free from treats can we expect to find on the high street of late? 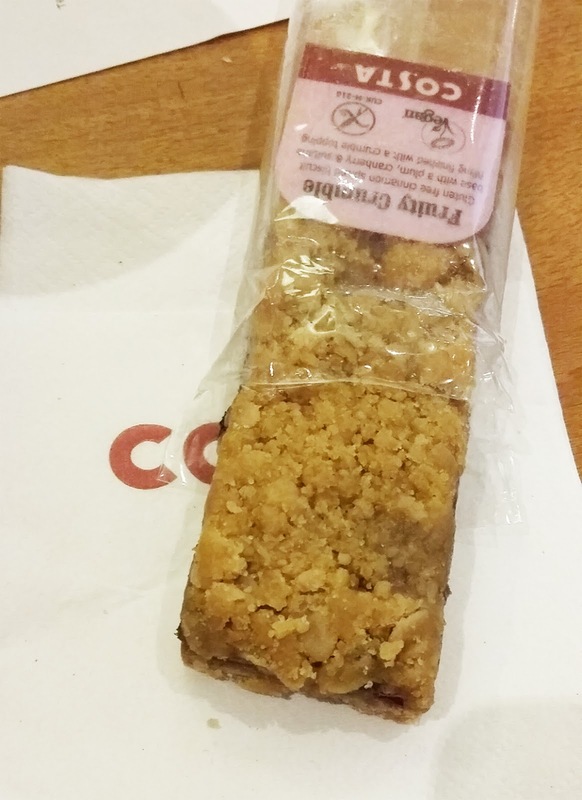 One of the countries largest coffee shop chains – where your almost guaranteed to find at least one or two within a city centre, Costa, has introduced a small selection of free from cakes and bakes, alongside food on the go, to their coffee shops. 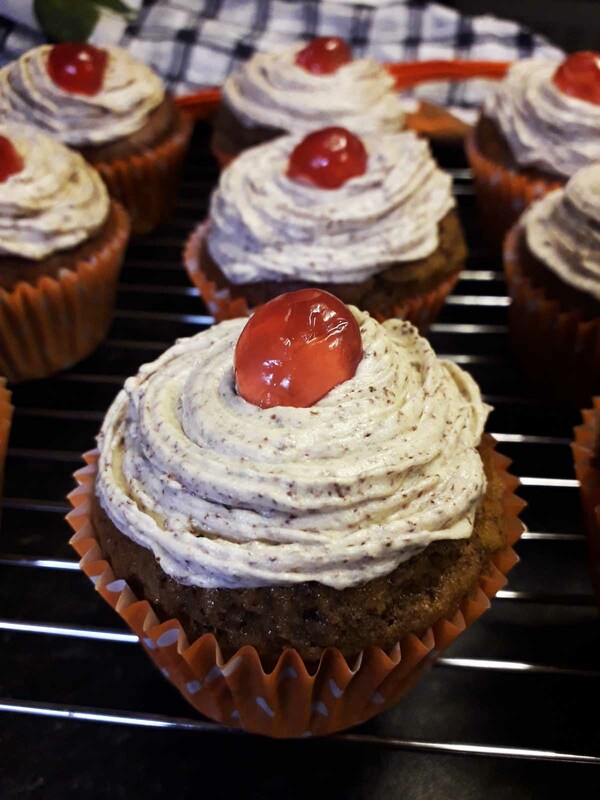 Whilst finding the necessary details about these treats can prove to be a bit of a long winded task, with very little menu options now listed on their site, you can at the very least download their dietary information guide. It will take a bit of scrolling through to find the options available for your needs, but their guide is thankfully more thorough than other chains – listing items that contain gluten, milk, eggs, peanuts, and plenty more options to negotiate the minefield of allergens. For fellow coeliacs, a long scroll through will reveal a few options to snack up'ont, including their new paradise slice - a vegan friendly, fruity bake, alongside their chocolate brownie (this does however contain dairy and eggs), and their cherry bakewell mini tarts (these are unfortunately not vegan). Other free from choices are available also, including their fruity crumble bar, granola square, and flapjacks – however, these contain oats so are not suitable for coeliacs, with the exception of the fruity crumble bar which does contain gf oats – however, if like me even gf oats disagree with you, it's best to avoid it. Snacks chosen, you'll be wanting something to go with your tasty treat, like most chain coffee shops Costa do offer dairy free milk alternatives, with soya milk available for their coffees and teas, alongside the new addition of coconut milk – meaning that you can at the very least sip on a latte. The majority of their drinks can be made dairy free, but it is worth checking the allergy guide for any sneaky allergens in those syrups and flavourings before ordering. The next choice up is Starbucks, their choices really are pretty slim, and try negotiating their allergy guide.. it took some effort to even find it at first! Your safest choice is the pre-packed treats on the counter, usually ranging from a fruit mix, to a dark chocolate bar – both of which are also dairy free/vegan. Milk chocolate coins are also available, these are gluten free but not dairy free/vegan. Your local branch may also have additional choices to buy at the counter – it should go without saying, always check the ingredients. So, with few snack options in choice, your safest bet is to probably take your own snacks with you and grab a drink instead.. but that can still involve negotiating a minefield of problems.. Dairy free milk alternatives are available, with a larger choice of options available than Costa – offering soya, coconut, almond, and oat milk. However, some of the additional options such as syrups/flavourings may not be dairy free, so it's best to check their allergy guide first. Their oat milk is also best avoided for coeliacs, as this has been made with non-gluten free oats as stated in their allergen guide – this does unfortunately leave open a minefield for cross contamination with the drinks making process, so I'd advise using your own personal judgement here.. Personally, I always opt for a cup of tea instead if I find myself at a branch of Starbucks now.. but that's just me! 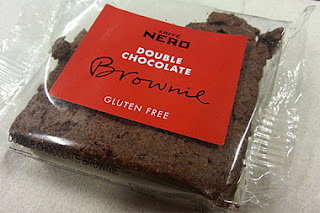 Next up for more free from choices, is Caffe Nero, their online menus offer a handy allergen guide making it easy to find those safe choices to snack on, whatever your dietary requirements. For fellow coeliacs, a chocolate brownie is available (unfortunately this is not dairy free/vegan), alongside a vegan option of an apple & blackcurrant crumble bar which contains gluten free oats. Sadly, that's where most of the choices end of late, with an additional snack choice of a dark chocolate bar, dried fruit, or chocolate rice cakes (these are not dairy free/vegan). For drink options as per most chain coffee shops there is at least a dairy free milk alternative of soya milk, however it is best to check the allergen guide as some syrups/flavourings do contain milk. So much like Starbucks, your best option may be a cup of tea with soya milk – this is usually my default choice. Next up is Patisserie Valerie, whilst they may only have a small selection of free from treats, it is worth noting for fellow coeliacs. 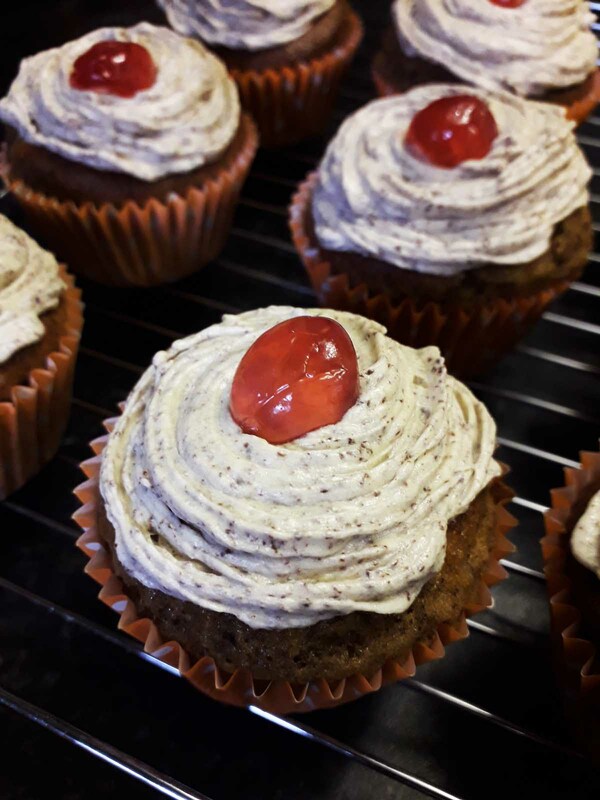 With their selection of gluten free cakes in store being a great contaminant free choice – all coming in their own sealed individual packs! These are sadly not milk free or vegan, but they are worth noting for an additional option if you are coeliac/gluten intolerant. For drink options, it may not be listed on their site, but some branches do also offer soya milk in store – just ask, I have found one or two branches offering it. Fruit tea blends are also available on their menu, and all of the tea blends can come without milk also. 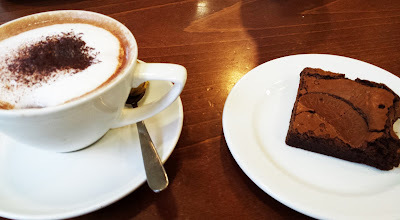 Whilst not initially a coffee shop per say, Pret is another option for free from choices on the high street, with handy allergen guides available on their site. 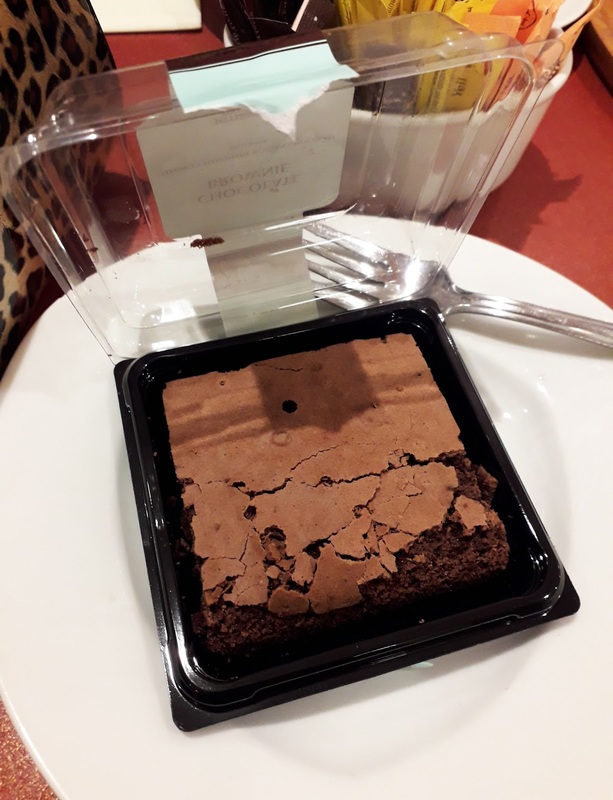 They may have few options to choose from, but they do offer a vegan brownie which is also gluten free, alongside their chocolate coconuty bite, and a sea salted dark chocolate bar (this does unfortunately contain milk, so it is not vegan). For drinks, much like other chains they also offer soya milk, alongside oat milk – this is however made with non-gluten free oats so is unsuitable for coeliacs. Much like Starbucks, and Caffe Nero, I'd advise going for a milk free tea, or a tasty tropical green tea instead. 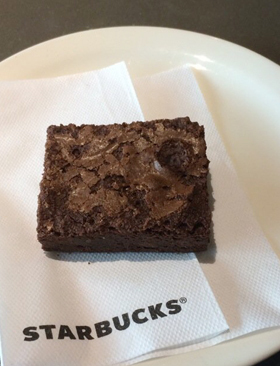 Finding allergy info online for other high street coffee shops and chains can be pretty difficult, so it's best to ask the staff in-store at places such as M & S, John Lewis, and Debenhams, which do offer some free from options, mostly being pre-packed cake bars and slices such as Honeybuns, and We Love Cake. Dairy free drink options can vary between each place, but soya milk is usually available at most – as always, do ask the staff if you are unsure. All failing, it's not the best option, but I find keeping an emergency snack or two in my bag helpful when visiting a chain coffee shop with friends – sometimes there may be few and far choices for a free from treat, so it's always handy to keep something in your bag just in-case, so you can at least grab a cuppa! Keeping a sachet of lacto-free milk on the go is always helpful if your lactose intolerant - I always travel with at least one to hand! For fellow coeliacs, my best option is always Patisserie Valerie for their handy individual cakes, for a dairy free option Costa is the next best choice, alongside Caffe Nero for a vegan option. Whilst, there is still a long way to go for free from options on the high street, it's worth noting that some improvements have at least been made at a couple of places, but it's pretty disheartening to see little efforts made to reduce cross contamination at some chains, so I'd always advise using your own personal judgement when your craving a dairy free latte and a free from treat. Scrumptious banana and chocolate muffins : Gluten and dairy free. 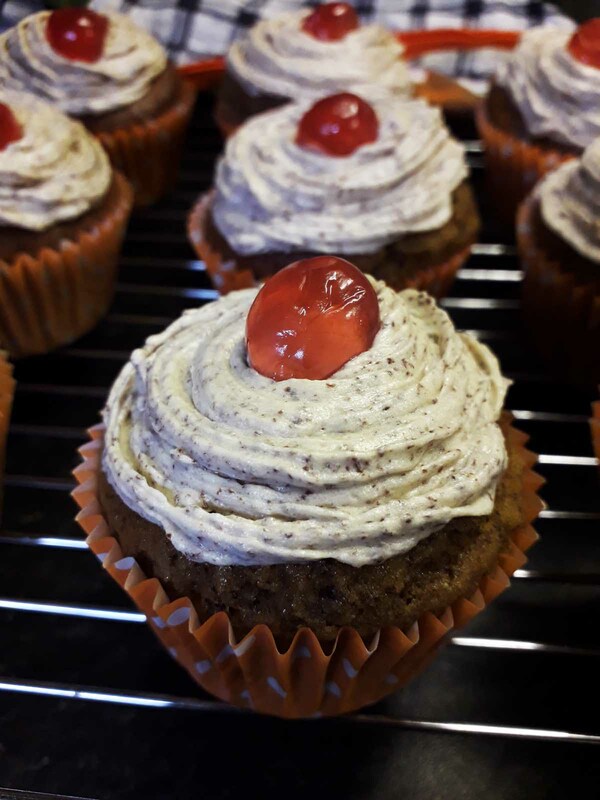 If like me you've got a ripening pile of bananas that were bought in an attempt to be 'healthy' over the festive period that immediately failed, then you may want to treat yourself to a tasty batch of these banana muffins - besides, there's still some fruit in them!! These muffins are a rather yummy way to use up an over ripe banana - now you just need to worry about what to do with the rest of them.. They're made even tastier with a helping of dark chocolate in the bake, giving these muffins a rather scrumptious flavour. Whisk together the sugar with the eggs till blended, add in the vanilla extract and mix. Sift in the gluten free self raising flour a little at a time and blend, adding the xanthan gum with the final measure of the flour to mix. Prior to baking you'll want to melt the stork down in a small heatproof bowl, add the banana in with the stork and blend to a squishy, mushy mixture. Spoon this into the flour mixture and blend. Finally, add in the grated dark chocolate – this adds a yummy taste to your bake! Then stir to mix. Spoon the mixture into the cases, filling each around 2/3 full. Then bake for 15-20 minutes till a skewer comes out clean - in my fan oven these took 15 minutes. Place on a wire rack to cool for an hour or so. Once cooled, you'll want to start making your tasty frosting to top the muffins. This simple frosting adds some more grated dark chocolate into the mixture, giving it a rather scrumptious finishing touch! Mix the stork with half the icing sugar till combined, then sift in the remaining icing sugar and whisk. Adding the grated dark chocolate to finish, and whisk well to combine. Spoon the mixture into a piping bag with a nozzle of your choice, then pipe swirls on top of each muffin - finishing them off with a glace cherry half. Recipe adapted from Phil Vickery's “Essential gluten-free”.